The New Paltz Village is currently considering passing an amendment that would require residents to remove snow and ice from sidewalks within 12 hours after snowfall. On Monday, Jan. 14 the New Paltz Village posted on their Facebook page to inform village residents of the open public hearing regarding Village Code Chapter 175-11 which states the requirements for snow and ice removal. The current rule requires property owners in the village to remove snow and or ice from sidewalks within 24 hours after snowfall or ice formation, the proposed amendment would shorten that time frame to 12 hours. The New Paltz Village is considering this amendment out of request from community members who claim to not be able to safely walk on the sidewalks and believe that the 12-hour window will help improve sidewalk conditions. New Paltz resident Agnes Devereux supports the amendment being passed and believes the 12-hour rule would be more effective if enforced. 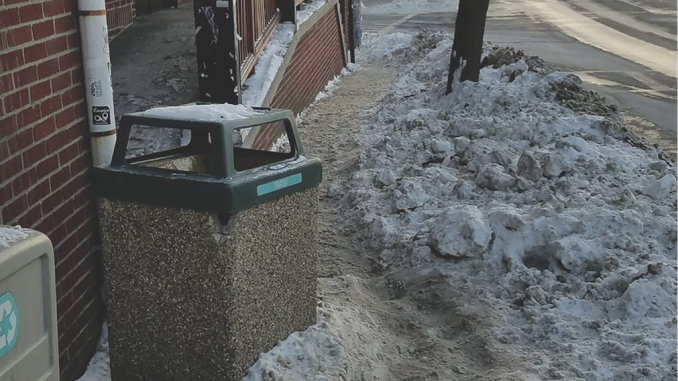 Mayor Tim Rogers claims that the revision of the current code would aim to improve the walking conditions and safety for pedestrians who may not always be able to walk to work or school due to the sidewalk conditions after snowfall or ice formation. In addition, the amendment would align the Village Code with the laws in the Town of New Paltz, City of Poughkeepsie, Town of Poughkeepsie and City of Kingston, which all enforce a 12-hour window for snow and ice removal. Although the amendment was proposed by community members, other village residents have expressed concern regarding possible changes to the law. New Paltz resident Celeste Tesoriero does not support the passing of the amendment. Rogers claims to be aware of the challenges the tighter time constraints may pose for residents and claims that the revision is not meant to penalize village residents. Rogers said they are considering making the time frame depend on the severity of the storm or the amount of snowfall. If there is six or fewer inches of snowfall then residents will be required to clean their sidewalks within 12 hours, in the occurrence of a larger storm resulting in greater than six inches of snowfall, the 24-hour window would be enforced.